There are many different ways to use the three types of loop blocks. Recall the different common repetitive actions you thought of back at the beginning of this lesson. How will you use loops to create something useful, entertaining, or interesting? Create an animated gif (looping image that changes) and add music that matches. 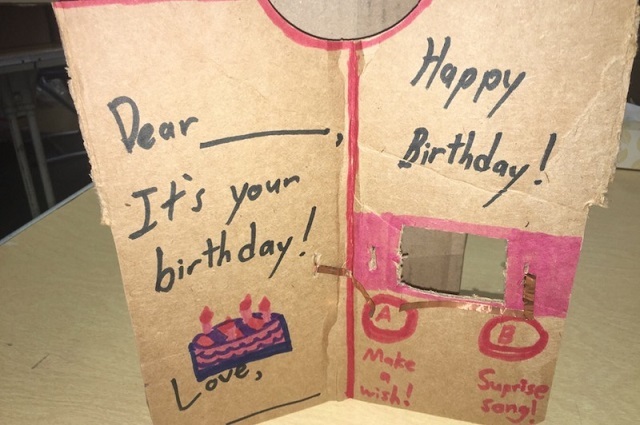 Create animation that repeats for one of the melodies included in Make Code (like Happy Birthday). Create different animations that run when different buttons are pressed. Create an alarm that includes sound and images. What will set the alarm off? What will make the alarm stop sounding? Use servo motors to create a creature that dances and changes its expression while a song plays. This project uses the micro:bit light sensor to display a happy face when it is sunny, and a frowning face when it is dark. 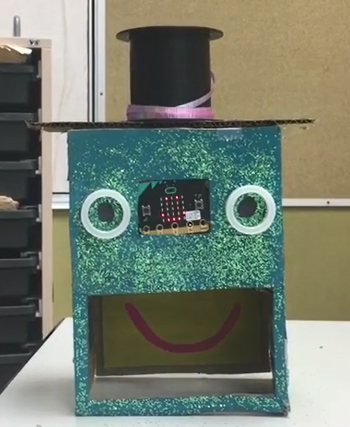 The micro:bit is connected to a servo mounted on the inside of the container, and the smile and frown are attached to plastic coffee stirrers with tape and hot glue. Explain how you decided on your particular “loopy” idea. What brainstorming ideas did you come up with? What was something that was surprising to you about the process of creating this program? Describe a difficult point in the process of designing this program, and explain how you resolved it. What feedback did your beta testers give you? How did that help you improve your loop demo? 4 = At least 3 different loops are implemented in a meaningful way. 3 = At least 2 loops are implemented in a meaningful way. 2 = At least 1 loop is implemented in a meaningful way. 2 = Few variable names are unique or clearly describe what information values the variables hold. 4 = Uses sound, display, and motion in a way that is integral to the program. 3 = Uses only two of the required elements in a way that is integral to the program. 2 = Uses only one of the required elements in a way that is integral to the program. 1 = None of the required elements are used.